Our letter in our Pre-K class was doing letter P last week. 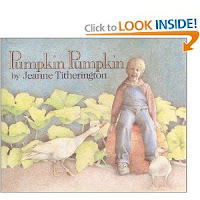 Appropriately, we decided to center our weeks plans around the book, "Pumpkin, Pumpkin," by Jeanne Titherington. Mrs. D is a great advocate of books with the children and the printed word. On Monday, we read the book "Pumpkin, Pumpkin" to the children. Then we created a class book based on the pumpkin book. To make our class book we split the children into groups. With each group we created a picture, then the children dictated words to me that I wrote on the page. I titled my book "Pumpkins." We are then going to let the children share the book with their families. I think the books we are creating are so cute. So that all the children would be doing something each day we also worked on a jack-o-lantern. On Monday, we painted a piece of paper orange. Then on Friday, I gave them a pumpkin pattern to trace. After they traced the pattern, they cut it out. Finally, I gave them a piece of black paper to cut out a face which they glued to their pumpkin. On Wednesday, we made our porcupine for letter P. The weeks are flying by. I love the pumpkin class book! It looks great! I'm going to have to try it! Thanks!